D.A.P.S. was asked to investigate a personal residence in Frederica, Delaware that was built in the early 1700's. This house is your typical 2 story brick colonial of the period with about 1200 square feet of living space. The current residents asked us to investigate strange noises and activity they have experienced. We were given a tour of the home, and told about the activity they have experienced there. The residents claimed experiencing cabinets and drain stoppers being manipulated in the kitchen, and unseen entities moving about the upper hallway, as well as hearing footsteps and other noises. With this information, the D.A.P.S. team set up our equipment and paired off into teams of two. D.A.P.S. investigated the home for several hours using all available equipment and techniques. One of the most important things for a paranormal group to do is capture solid evidence of paranormal activity. Further, its just as important to capture evidence that backs up what the resident claims is happening at the location, and that will back up experiences had by the paranormal investigators during their investigation. Lastly, its also important to present rational explanations for those events that are found to not be paranormal. We will cover Video evidence first, followed by EVP's, and Photos if any of the above were found. One note regarding Orbs. Many paranormal professionals dismiss Orbs outright. Far too many groups try to present paranormal Orb evidence that allegedly show Orbs, when in fact they are bugs or more likely dust. D.A.P.S. does not completely dismiss Orbs as a legitimate paranormal event, however, D.A.P.S. is very cautious about presenting what we believe may be legitimate Orbs unless there is compelling evidence as to the Orb being a legitimate paranormal event. During the investigation, the D.A.P.S. team took nearly 20 hours of Digital IR Video footage trying to capture signs of paranormal activity. After carefully reviewing the footage, we only found one anomaly. This was a fluxuation of IR Cam 3 which was in the main bedroom looking down the hallway where footsteps were reported. We show this clip here because we believe that it backs up photo evidence presented later in this case. This is important because no other IR Cam experienced the same issues during the investigation, thus ruling out any issue with the IR Recorder. The IR Cams have an auto focus feature, and will change focus if it senses an object move closer to the camera line of sight. We believe that these fluxuations shown in this clip show the IR Cam picking up an unseen object moving in front of the Cam. This happened several times with this Cam only, this clip being of the most obvious and prolonged event. Besides the video and digital photo evidence, the D.A.P.S. teams were able to perform a lot of EVP and audio Spirit Box sessions trying to make contact. On review of the evidence, we found a few interesting and unexplainable EVP's. Note: For the best listening experience of Spirit Box clips, use headphones and adjust the volume to medium/low on your PC. For the EVP Clips, turn your volume up. This Spirit Box response was captured during the investigation with the digital recorder that was carried by the investigators in the main bedroom. This happened during a Spirit Box Session with Kim, Val, Jenn, and the resident female. This is a clear response, what you will hear is Kim asking about why there was no interaction with the beautiful women in the room, a short few seconds later the word Women is spoken clearly by the Spirit Box. In between sessions when no investigators were in the house, the recorder in the attic picked up a voice. The attic is a hot stuffy room, and is fairly sound proofed from the outside or lower levels with only very loud noises filtering through. This recording was captured near the end of the investigation, and is obviously close to the recorder as opposed to coming from down below. We are not 100% sure what is being said, we think possibly "I Do" or "Ado"? We will post the original clip first, then the clip with the voice enhanced as to volume. There was one other EVP we captured. This was captured down in the main living room. Kim was investigating with the resident who's name is also Kim. She asks which Kim the spirit wants to talk to, and asks if it's the one who lives there. The response is faint, but the answer is yes. Again, we have posted below the original clip, then an enhanced copy with the response enhanced as to volume. True paranormal activity on any equipment is much sought after by paranormal investigators. This however is extremely difficult to obtain for various reasons. On occasion, paranormal investigators get what they are seeking. You never know what your going to capture until you review the evidence. You also never know what piece of equipment will be the one that captures the undeniable evidence you are looking for. D.A.P.S. is constantly updating and adding to its equipment roster. For this investigation we had a new Full Spectrum Digital Camera. This is a specially modified digital camera with the filters removed so the full light spectrum will show and hopefully reveal evidence that would be missed by ordinary IR or digital flash cameras. This investigation had us quite excited from the beginning. We were contacted by the resident and told of a photo they had received from a friend who was dog sitting while they vacationed. This person knew of the events that the resident was experiencing. We were told that this guest decided to take a photo of the dog he was sitting to send to his mom. 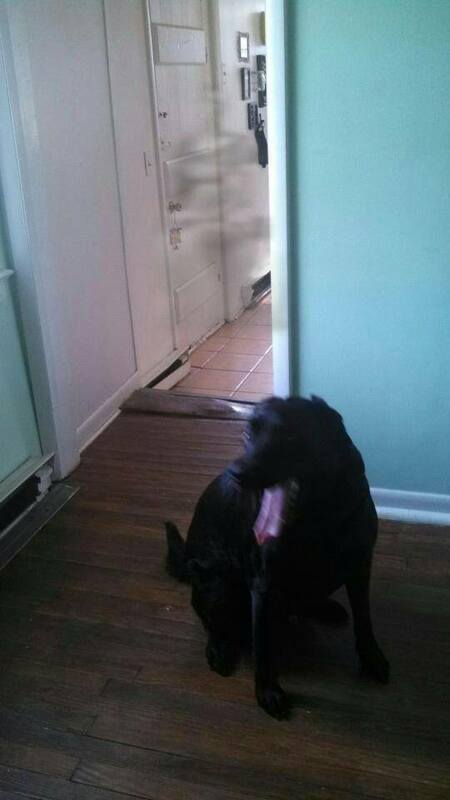 When he reviewed the photo he was surprised to see what appears to be a figure in the photo. This can be seen below. This photo appears to be quite compelling. However, we have a few issues with it. First, the figure appears to be still in the little area between the kitchen and the doorway, yet there is a bit of it on the right door frame on this side of the doorway. Second, we have never seen an apparition that looked like this. They are either all white mist or all darker mist. This one is a mix that looks sprayed on, thus the over spray on the wrong side of the door frame. Last, we did run this photo through software to determine if it is genuine or not, and it did come back with the photo not being original, IE: It was altered or Photoshopped. We also did not take the photo, and we were not there to witness the event, so we have to leave this one hang out there for now. In spite of the questions regarding the previous photo taken by a friend, D.A.P.S. investigators took nearly 200 images during the investigation. About half of these were taken with the new Full Spectrum Digital Camera. We believe we have captured the best digital photo D.A.P.S. had ever gotten. This was taken by David as he got to the top of the stairs. He paused and took a photo towards the main bedroom that is where the resident reported footsteps and has seen shadows. The only other person in the house was the resident husband who was still down on the staircase behind David and completely out of view. D.A.P.S. has captured a full body apparition standing in the doorway of the main bedroom exactly where the resident reported footsteps and seeing shadows, and where Cam 3 tried to refocus. At first glance, the feet are very clear, but if you examine the photo you can see a head and shoulders in the halo from the IR Cam lights. It appears to be a short figure as the head is below the center of the IR Lights on the Cam, and it appears to be leaning a little onto a walking stick or similar object. We will post several different versions of this image. The first one below is the untouched original. This Full Spectrum photo is one of the best we have ever captured of a full body apparition. It is quite clear that there is a short figure standing there looking into the room. It appears to be leaning on something like a walking stick. We think it is male, possibly a younger boy, or shorter man. The Cam IR is about 5' off the floor. However, keep in mind that back in the 1700's and 1800's people were a lot shorter than they are today. Just to show that there are no dark marks on the floor there causing a false conclusion, the next photo is of the area where the figure was seen and captured in a photo using the Full Spectrum camera with Flash. Also note the height of the Cam on the tripod. D.A.P.S. team members usually have some personal experiences during an investigation. Personal experiences are paranormal events that take place that affected the investigators during their investigation, but were not captured by the equipment. We will list them here as they belong with the evidence we did capture. On this investigation D.A.P.S. team members used another new piece of equipment, the Ovilus III. This is a device that is reported to perform many different functions all in one package. We used this device a lot trying to get some sort of activity. Team members mostly used the Dictionary Mode, Q & A Mode, and White Noise Mode. We did get a few words from the Dictionary Mode and Q & A Mode. Some we did not understand at the time, others still make no sense. In the kitchen, we got the word Eat. This was appropriate. In the lower level both in the entrance area in the kitchen, and in the dining area we got the same words multiple times. Business, Entire, and Human. The original builders of the home ran local businesses. Mainly farming, tanneries, and grist mills. Grist mills ground corn for Horse Feed, and Wheat for Flour. Humans used the Flour. A very old use of the word Entire meant Horse. Horses eat ground corn. So there may have been some correlation here. We also got the words Under and Country. We could not make any sense of these words or correlations to the property or what went on there. We got no hits with the White Noise mode. In all we were not too pleased with the performance of the Ovilus, and would recommend paranormal investigators to buy a Mel Meter and Spirit Box instead. The resident's had reported issues with the kitchen sink drain strainer/plug popping out on its own. We carefully inspected this and the resident even filled the sink with cold water so we could see if it would happen, which it did not. We did discover that on other sinks where we examined this style strainer/plug it did not have to be forced into the drain hole. They just sat down in there, and the water pressure keeps the stopper in place. The resident here has to press the strainer/plug into the drain piece. The rubber plug on the bottom is wedge shaped. We think that normal physics is at play here. You have the energy of the compressed rubber pushed into the drain, and the wedge shape of it, along with extra cold well water or extra hot dish water, and the strainer/plug is just popping out due to contraction or expansion. During the walk through we were also told of a cabinet in the kitchen with a hook and eye latch that would seem to pop open on its own. We tried to get this event to repeat itself with no luck. The floor in the kitchen is solid as a rock, and did not move or vibrate when we jumped up and down in there. We also knocked and banged on the counter and cabinet body, and they too are solid as a rock. However, the upper part of the door to this cabinet has a little warp to it that causes tension on the latch. This is stored energy, and it may be possible that the latch is coming undone on its own some how over time. The washing machine and dryer are close by in the kitchen which may be a source of vibrations. We have no other opinion on this event, it remains unexplained. We did not capture the drain strainer/plug in the kitchen popping out, or the cabinet unlatching as explained earlier. The resident husband stated that he thought he herd footsteps in the attic. It may be possible they are instead coming from the hallway where the resident wife claimed to hear them come up the hallway to the bedroom door, stop, then turn and go away on several occasions. We did not capture any evidence of the apparition down in the kitchen/dining room area as seen in the photo supplied by the dog sitter. The audio recorders did not pick up any footsteps either in the attic or in the hallway, but they may have occurred when other things were happening that over powered possible footsteps sounds, and prevented them from being recorded. In conclusion, after reviewing all of the photos, video, and audio captured, and in consideration of the paranormal evidence that was found at the location, D.A.P.S. believes that there is paranormal activity happening at the residence. This seems to be concentrated in the upper hallway and main bedroom areas. The voices on the EVP's, the compelling photo of a full body apparition at the main bedroom door, and the video of IR Camera fluxuations in an area of the main bedroom where we captured solid evidence of spirit activity, indicates to us that the haunting events reported are not residual, but most likely are intelligent in nature. The absence of any high level physical interactions indicates to us that the haunting events reported are not demonic or evil in nature. Nothing in the evidence supports that, or any of the commonly accepted scenarios. The residents have nothing to fear as the entity we believe is there is not harming anyone. We suggest that the resident sit in the main bedroom, and tell whom ever is there, that they are not able to stay there, and must cross over, or leave, that they are not supposed to be there. They might also want to perform a cleansing with Sage to help remove any lingering spirit energy.